Assemblyman Elect James Gallagher for the Yuba City California area said last night he will talk with Sikhs about legislation allowing “Kirpans” in California Courtrooms. I would like to encourage all Sikhs to support this effort of persuading Mr. Gallagher to introduce a bill before the California State Legislature to allow Sikhs to wear a “Kirpan” in California Courtrooms. Congratulations on being elected to our State Assembly district here in Sutter County. I am one of the thousands of people in your district that follow the Sikh faith and I want to bring to your attention an important issue about how Sikhs have been banned in California from wearing one of our "articles of faith" while serving on jury duty in California Courtrooms. 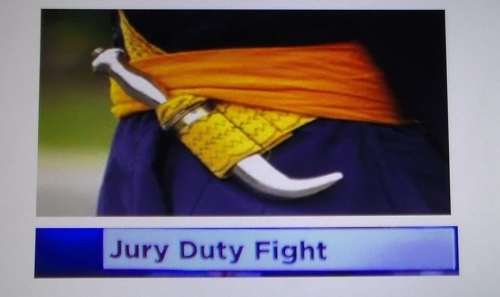 The fact that Sikhs are allowed to wear a “Kirpan” on a case by case basis in US Federal Courtrooms, some State Courthouses and in several western countries like the UK, Australia and Canada, shows that California is sadly faltering on this issue of religious freedom. I would like your help in introducing a bill before the California State Legislature to allow Sikhs to wear a “Kirpan” with a reasonable blade length of six inches in California Courtrooms. Hundreds of thousands of Sikhs living in California have the same beliefs as me about the duty of a Sikh to wear their kirpan at all times, so by supporting this issue you will be doing a great service to the Sikh community not only in your district but state wide. I pray you will consider my proposal and please call or write me about any other Sikh issues you may have questions or need information about as I do have a great deal of knowledge about the Sikh faith and issues in California and around the world. Please view some of my other videos and social media pages in order to see my views and knowledge about these Sikh issues.